This post was sponsored by Qkids. All opinions are my own. 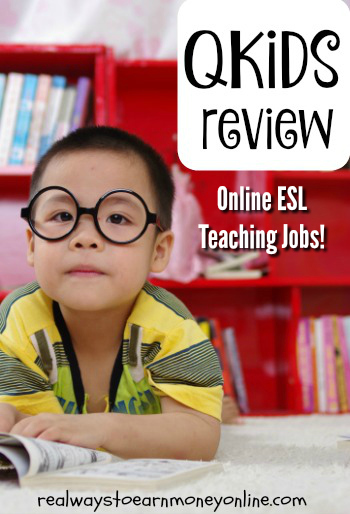 Qkids is another online English teaching/ESL opportunity I'm introducing you to today. If you are in the US or Canada and you have a college degree or are currently enrolled in a university program, there is a chance you may qualify to teach English from your home for Qkids and earn money. Qkids, founded in 2015, specializes in e-learning for Chinese children ages 5-12 years. Even though the company is just two years old, they are now one of the leading companies of this kind in the Chinese market. They have four established offices in China along with many designers, course planners, engineers, and teachers working with them to help ensure Qkids provides a great learning experience for children. If you are hired as an online English teacher for Qkids, you will use an interactive software program provided by the company to teach English to Chinese children. If hired, the company will fully train you to use the software. Note that you do not need to know Chinese, nor do you have to have past teaching experience to qualify. If you are digitally literate with a high level of English proficiency, an outgoing personality, and you can teach engaging lessons, then this position may be a fit for you. Qkids allows you to choose your own availability, so this could be a fairly flexible opportunity. However, it is required that you commit to a minimum of 12 classes per week (6 hours). Also, you may not do more than 38 classes per week. Classes last approximately 30 minutes each. This is the time table when Day Light Saving Time starts from March 11th, 2018. From today until Mar. 11th, the time is one hour ahead. Qkids claims you can earn between $16 and $20 hourly based on your class ranking with potential to receive bonuses. Payments are made monthly. Payments are made monthly via bank transfer to American and Canadian card holders with the transfer fee covered by Qkids. Overall, the company has decent reviews from workers. You can check out the Glassdoor reviews here, and the Indeed reviews here to see what Qkids workers have had to say about the opportunity. If you are interested in signing up to teach English to Chinese children via Qkids, you can go here to begin the application process. You can also send an email to teacher@qkids.net to get started.